You don’t have to look far in North American culture to find Dead Indians. ‘Dead’ as in the idea of something that never really existed. From film characters to rodeos and sports teams’ mascots—even in how Native leaders represent themselves to the white world—buckskin and a feathered headdress are ever handy signifiers of Indian authenticity. In this excerpt from his new book, The Inconvenient Indian, King surveys the history of the Dead Indian in white culture. Indians come in all sorts of social and historical configurations. North American popular culture is littered with savage, noble, and dying Indians, while in real life we have Dead Indians, Live Indians, and Legal Indians. Dead Indians are, sometimes, just that. Dead Indians. But the Dead Indians I’m talking about are not the deceased sort. 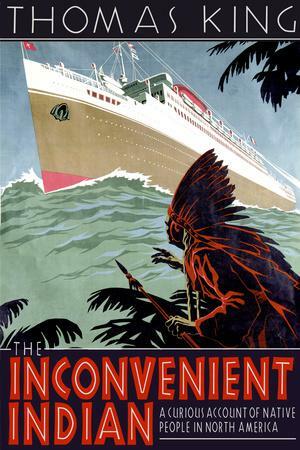 Nor are they all that inconvenient. They are the stereotypes and clichés that North America has conjured up out of experience and out of its collective imaginings and fears. North America has had a long association with Native people, but despite the history that the two groups have shared, North America no longer sees Indians. God, I love the French theorists. For those of us who are not French theorists but who know the difference between a motor home and a single-wide trailer, a simulacrum is something that represents something that never existed. Or, in other words, the only truth of the thing is the lie itself. You can find Dead Indians everywhere. Rodeos, powwows, movies, television commercials. At the 1973 Academy Awards, when Sacheen Littlefeather ( Yaqui-Apache-Pueblo) refused the Best Actor award on behalf of Marlon Brando, she did so dressed as a Dead Indian. When U.S. Senator Benjamin Nighthorse Campbell (Northern Cheyenne) and W. Richard West, Jr. (Cheyenne-Arapaho), the director of the American Indian Museum in New York, showed up for the 2004 opening ceremonies of the museum, they took the podium in Dead Indian leathers and feathered headdresses. Phil Fontaine (Ojibway) was attired in the same manner when he stood on the floor of the House of Commons in 2008 to receive the Canadian government’s apology for the abuses of residential schools. I probably sound testy, and I suppose part of me is. But I shouldn’t be. After all, Dead Indians are the only antiquity that North America has. Europe has Greece and Rome. China has the powerful dynasties. Russia has the Cossacks. South and Central America have the Aztecs, the Incas, and the Maya. North America has Dead Indians. This is why Littlefeather didn’t show up in a Dior gown, and why West and Campbell and Fontaine didn’t arrive at their respective events in Brioni suits, Canali dress shirts, Zegni ties, and Salvatore Ferragamo shoes. Whatever cultural significance they may have for Native peoples, full feather headdresses and beaded buckskins are, first and foremost, White North America’s signifiers of Indian authenticity. Their visual value at ceremonies in Los Angeles or Ottawa is—as the credit card people say—priceless. Which brings to mind that great scene in the 1994 film Maverick, in which Joseph, a Native con man played by the Oneida actor Graham Greene, spends his time pandering to the puerile whims of a rich Russian grand duke, played by Paul L. Smith. Smith is on a grand tour of the West and has become a bit bored with all the back-to-nature stuff. He has shot buffalo, lived with Indians, communed with nature, and is casting about for some- thing new and exciting to do with his time. Greene, dressed up in standard Dead Indian garb, asks Smith if he would like to try his hand at the greatest Western thrill of all. “What’s the greatest Western thrill of all?” asks Smith. “Kill Indians,” says Greene. “Kill Indians?” says Smith. “Is that legal?” Sure, Greene assures him, “White man been doing it for years.” So Greene gets Mel Gibson to dress up like a Dead Indian, and the grand duke gets to shoot him. The greatest Western thrill of all? You bet. On the other hand, if you like the West and are the outdoors type, you can run out to Wyoming and pedal your bicycle over Dead Indian Pass, spend the evening at Dead Indian campground, and in the morning cycle across Dead Indian Meadows on your way to Dead Indian Peak. If you happen to be in California, you can hike Dead Indian Canyon. And if you’re an angler, you can fish Dead Indian Creek in Oregon or Dead Indian Lake in Oklahoma, though the U.S. Board on Geographic Names recently voted to rename it Dead Warrior Lake. Sometimes you can only watch and marvel at the ways in which the Dead Indian has been turned into products: Red Chief Sugar, Calumet Baking Soda, the Atlanta Braves, Big Chief Jerky, Grey Owl Wild Rice, Red Man Tobacco, the Chicago Blackhawks, Mutual of Omaha, Winnebago Motor Homes, Big Chief Tablet, Indian motor- cycles, the Washington Redskins, American Spirit cigarettes, Jeep Cherokee, the Cleveland Indians, and Tomahawk missiles. Probably the most egregious example is Crazy Horse Malt Liquor, a drink that one reviewer enthusiastically described as “smooth, slightly fruity with an extremely clean, almost Zinfandel finish that holds together all the way to the dregs of the bottle. Personally we think the chief should be proud.” That the Hornell Brewing Company would even think of turning the great Oglala leader into a bottle of booze should come as no surprise. Corporate North America had already spun the Ottawa leader Pontiac into a division of General Motors, the Apache into an attack helicopter, and the Cherokee into a line of clothing and accessories. I once bought a pair of Cherokee underpants that I was going to send to my brother as a joke, but by the time I got them home and looked at them again, they had become more embarrassing than funny. One of my favourite Dead Indian products is Land O’ Lakes butter, which features an Indian Maiden in a buckskin dress on her knees holding a box of butter at bosom level. The wag who designed the box arranged it so that if you fold the box in a certain way, the Indian woman winds up au naturel, sporting naked breasts. Such a clever fellow. Of course, all of this is simply a new spin on old notions. The medicine shows that toured the West in the eighteenth and early- nineteenth centuries used Aboriginal iconography and invention to sell Dead Indian elixirs and liniments, such as Kickapoo Indian Sagwa, a “blood, liver and stomach renovator,” Dr. Morse’s Indian Root Pills, Dr. Pierce’s Golden Medical Discovery, featuring the caption “Used by the First Americans,” White Beaver’s Cough Cream, Ka-Ton-Ka, and Nez Perce Catarrh Remedy. All of this pales by comparison with the contemporary entrepreneurs who have made a bull-market business out of Dead Indian culture and spirituality. Gone are the bogus potions and rubs that marked the earlier snake oil period. They have been replaced by books that illuminate an alternative Dead Indian reality, by workshops that promise an authentic Dead Indian experience, by naked therapy sessions in a sweat lodge or a tipi that guarantee to expand your consciousness and connect you to your “inner Dead Indian.” Folks such as Lynn Andrews, Mary Summer Rains, Jamie Samms, Don Le Vie, Jr., and Mary Elizabeth Marlow, just to mention some of the more prominent New Age spiritual CEOs, have manufactured fictional Dead Indian entities— Agnes Whistling Elk, Ruby Plenty Chiefs, No Eyes, Iron Thunderhorse, Barking Tree, and Max the crystal skull—who supposedly taught them the secrets of Native spirituality. They have created Dead Indian narratives that are an impossible mix of Taoism, Buddhism, Druidism, science fiction, and general nonsense, tied together with Dead Indian ceremony and sinew to give their product provenance and validity, along with a patina of exoticism. In the late nineteenth century, Kickapoo Indian Sagwa sold for fifty cents a bottle. Today’s Indian snake oil is considerably more expensive. In her article “Plastic Shamans and Astroturf Sun Dances: New Age Commercialization of Native American Spirituality,” Lisa Aldred makes note of someone called Singing Pipe Woman, in Springdale, Washington, who advertises a two- week retreat with a Husichol woman priced at $2,450. A quick trip to the Internet will turn up an outfit offering a one-week “Canyon Quest and Spiritual Warrior Training” course for $850 and an eight-night program called “Vision Quest,” in the tradition of someone called Stalking Wolf, “a Lipan Apache elder” who has “removed all the differences” of the vision quest, “leaving only the simple, pure format that works for everyone.” There is no fee for this workshop, though a $300-$350 donation is recommended. Stalking Wolf, by the way, was supposedly born in 1873, wandered the Americas in search of spiritual truths, and finally passed all his knowledge on to Tom Brown, Jr., a seven- year-old White boy whom he met in New Jersey. Evidently, Tom Brown, Jr., or his protégés, run the workshops, having turned Stalking Wolf’s teachings into a Dead Indian franchise. From the frequency with which Dead Indians appear in advertising, in the names of businesses, as icons for sports teams, as marketing devices for everything from cleaning products to underwear, and as stalking goats for New Age spiritual flimflam, you might think that Native people were a significant target for sales. We’re not, of course. We don’t buy this crap. At least not enough to support such a bustling market. But there’s really no need to ask whom Dead Indians are aimed at, is there? All of which brings us to Live Indians. Among the many new things that Europeans had to deal with upon their arrival in the North American wilderness were Live Indians. Live Indians, from an Old World point of view, were an intriguing, perplexing, and annoying part of life in the New World. My son’s girlfriend, Nadine Zabder, a meat science major, once told me: “You can’t herd them. They won’t follow. And they’re too heavy to lift.” Nadine was talking about sheep, but she could have been talking about Indians, for the same general sentiment appears in early journals and reports. The good news, the writers agreed, was that they were dying off in large numbers. 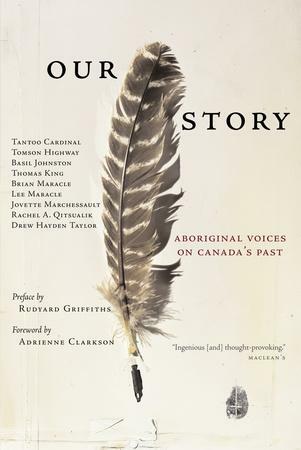 THOMAS KING is one of Canada’s premier Native public intellectuals.